I have sewn many costumes, dress etc in the past 30 years but never a quilt. I thought I'd start with a rag quilt since I'm about to have a new grandbaby and it looks pretty easy. Well, now I'm confused about the batting between the two layers of flannel. When I sew the squares together (after I sew the X on the flannel/batting/flannel square) do I sew thru the batting in the seam or not?? My instructions are very unclear and I've tried to find information on the internet and have been unsuccessful. Thank you!!! I cut my batting an inch smaller, sandwich, sew an X on them and then sew squares together with half inch seams. I use flannel as my batting, cut all pieces the same size, and stitch together. The X can be done at the end. You will love it, they are so soft and cuddly. This is what I do also with one exception: if you are using flannel as your "batting" and cut it the same size as your top and bottom piece, you don't have to sew the "X". The "X" holds the batting pieces in place so if you aren't using batting, no need for the "X"
I do not use batting. The two flannel squares make a good weight baby blanket. I agree with Cyn. You don't want Any batting wjen stitiching the squares together. It is really tough cutting thru the four layers of flannel to get the fringe look. I just finsih this one for charity. My friend is going to cut the edges of the flannel. Lucky me !!! So when you sew the squares together do you sew the batting in the seam? I don't use batting in the rag quilts, especially if you use flannel, that in itself is the batting. I also just use the two pieces, makes the quilt not so heavy. I use three layers of flannel all the same size that way I don't have to worry about it slipping and it makes a nice ruffle at the edges of the block. 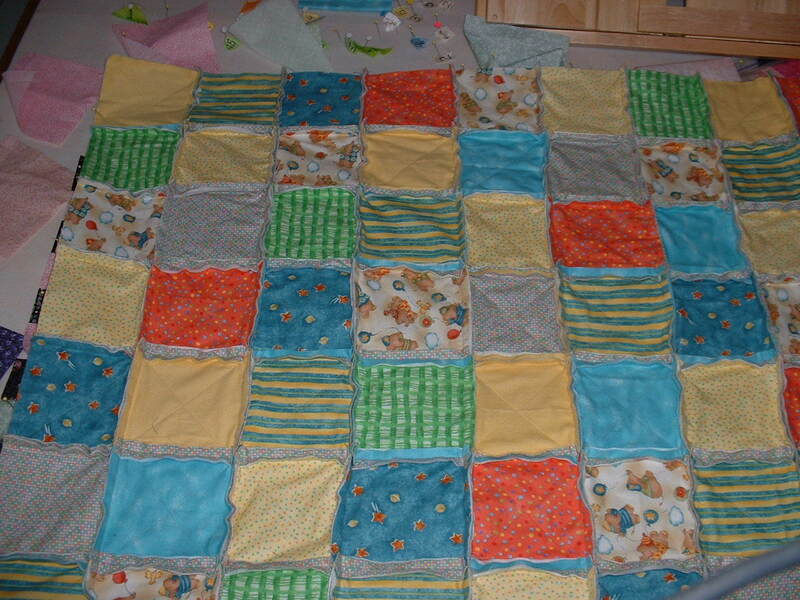 I made a flannel rag quilt for my DGD when she was very young. I didn't use batting. We live in the south, so the 2 layers of flannel provided all the warmth she needed. 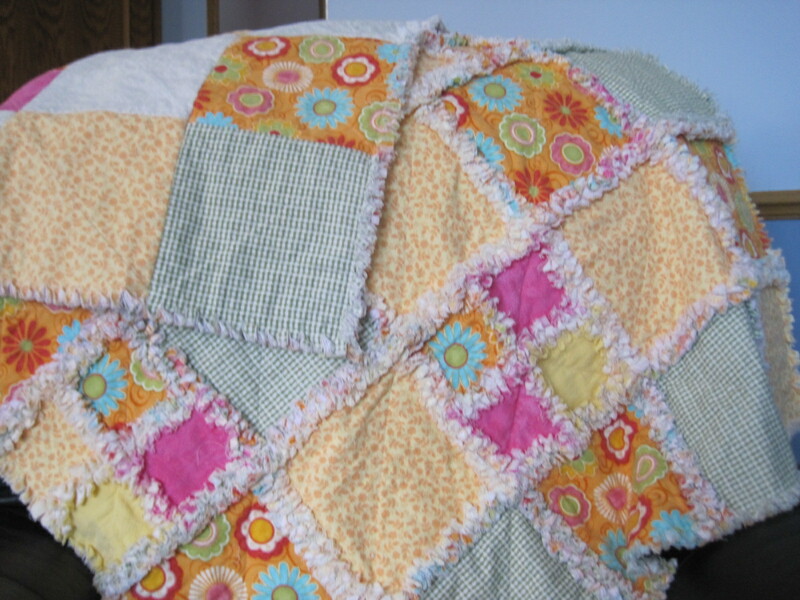 woodju3, I have made lot's of rag quilts, and I use warm and natural in all of them. Before I started, I read a lot of how to instructions and they all said to cut the batting smaller, and to NOT catch the batting in the seam. In other words, the only quilting holding the square together was the "X" in the center. I didn't want to do mine that way, so I cut he batting so a small amount of it was caught up in the seam, but didn't show after I fringed it. It makes for a stronger square. I saw a rag quilt once that didn't have the batting (polyester) caught up in the seam, and the batting had shifted after washing. I know most people don't sew in the batting, and are happy with it, but I just choose to do mine differently. I do the same as Kitsy. Patterned flannel for top and bottom layer, plain white flannel for center, all same size. Batting for sure isn't needed in between the two flannel layers. I've made a ton of these following the guidance of my wonderful quilting friend. If you use batting-then 3 inches smaller than whatever outside fabric size you choose. 1 inch seams, so there is still an inch between the seams and the batting edge. I don't use batting if the outside fabric is heavy, same for peekaboo or mock cathedral windows. If outside is quilting cotton or nursery knits, then yes either WN batting or plain flannel. If anything else, such as flannel, denim or fleece then no batting (too heavy). As "auntpiggylpn" said-no batting no X. As for the edge clipping at the end, I invested in "Fiskars 8-1/2-Inch Softouch Spring Action Rag Quilter Snip" available at Joanns and Amazon etc. It's the Best. Heavy short jaws make the rag part of rag quilting a snap. The short jaws reduce (not eliminate) snipping into the seam. I'd post a photo but I'm clueless for photos of any kind. DH does all that. Heres the link: http://www.amazon.com/Fiskars-2-Inch...s+rag+quilting if you want to see it. I have even used my embroidery machine to stitch a design in to squares. It requires washable or tear away stabilizer, but if you have very plain fabrics, it looks nice. And I didn't do it on every square - just here and there. 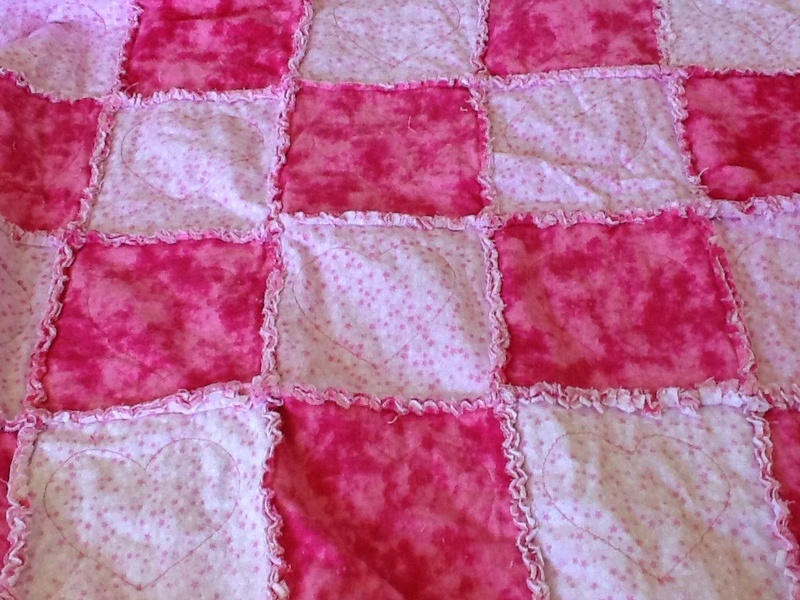 I love making rag quilts! I usually just use two layers of flannel, no batting. Have also used cotton on front, and flannel for back with no batting. I wash the first time at laundramat, bring home and shake the you know what out of it, then dry in my dryer, emptying lint filter several times while drying. This is what I do, the quilt is warm and cozy. It's a matter of personal choice, use batting or not. I use three layers of flannel (I use diaper flannel as the middle layer). Cut the squares all the same size (i use 8 inches). Make the three layer quilt sandwiches and sew an X through. Arrange in a pleasing fashion and sew together using at least a 1/2 inch seam. Then use snips (invest in a pair if you are going to make more than one rag quilt) to fringe the seams (I snip 4 to 5 snips per inch). Toss in washer and dryer. Beautiful! Then gift to baby of your choice! This one has two layers as the baby will be born in So Cal in August. I stitched little hearts in the center to hold them together. I have made others with three layers of flannel and they worked just as well, just a little heavier. I don't like using batting, it doesn't have the right feel to it imho. I use coton on one side, warm and natural batting and flannel on the other...its freezing here in the winter so the warmer the better. I also do the X in the middle of each square. Oh and I make the batting one inch smaller than the other two squares.